Do you want to be part of a success? Wednesday May 2, the fourth edition of the international maritime exhibition - the Danish Maritime Fair - will start at the exhibition centre Lokomotivværkstedet in Copenhagen. Up to 5,000 visitors are expected, not only people from Scandinavia but from all over the maritime world. The 2018 Fair has been expanded compared to the last Fair in 2016, and already now the area sold is 20 percent higher than in 2016. But there are still some attractive exhibition stands available for those who have not yet purchased one. Alongside the 3-day long Fair, an extensive maritime conference and meeting program take place at Lokomotivværkstedet. 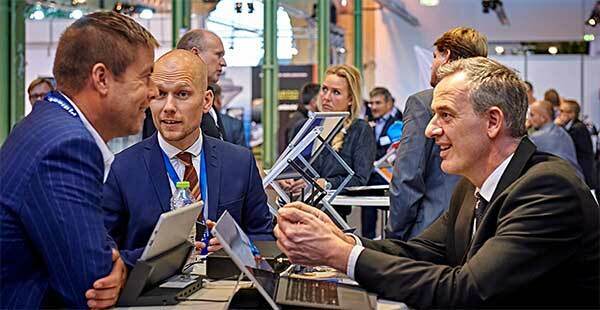 The Danish Maritime Fair 2018 is a unique opportunity for companies to showcase their products and competences to purchase strong visitors. Many of the visitors hold management positions in the 120 shipping companies who are expected to attend the exhibition again this year. The clarity of the exhibition makes it possible for exhibitioners to concentrate on the most important visitors, and in addition to this, our newly developed Partnercare Program will help exhibitors to get in contact with the right visitors. The rustic facilities and the exclusive Networking Dinner will ensure great opportunities for networking and for maintaining and expanding contacts in all fields of the maritime industry, including representatives from major organizations and key authorities. Admission tickets, which give entry to all three days of the exhibition, cost 200 Danish Kroner. Some conferences, workshops and events are free to attend, while others require payment. The method of payment is by debit card via the DMF-website. Besides accessing the Fair and the conferences, workshops and events that don’t require payment, all visitors are welcome to visit our restaurant where it is possible to purchase food and beverages. There will also be free access to lounge areas where visitors alongside exhibitioners are able to relax, meet or study some of the many maritime publications distributed at the Fair. The last edition of the Danish Maritime Fair, which was held in October 2016, was attended by more than 4,600 visitors, of which more than every 10th person was either company owner or top manager. 120 shipping companies chose to send one or more employees to the fair. Every fourth visitor came from abroad, and 71 countries from all over the world were represented at the exhibition. Two major international maritime conferences, and a number of smaller workshops and events, will take place at Lokomotivværkstedet alongside the Danish Maritime Fair in May 2018. The Danish Maritime Fair is part of Danish Maritime Days, an event that takes place from the 1st to the 4th of May. The event aims to showcase the innovative Danish maritime industry. Danish Maritime Technology Conference - gathers national and international maritime stakeholders for two short conference days. With keynote speakers and introductory speakers from at home and abroad, the Danish Maritime Technology Conference focuses on digitalization, new technologies and competences that comply with increasingly smarter, greener and more intelligent maritime systems. The conference takes place 2-3 May, and is hosted by Danske Maritime together with several members, including ABB, MAN Diesel & Turbo, Wärtsilä, Alfal Laval, C-Leanship, Pureteq and Danfoss. Opening Oceans Conference - focuses on commercial and sustainable business opportunities in the maritime industry, and how these can be extracted through new cooperation projects and competency exchanges across industries and operators. Central themes include energy production and access to minerals, changing logistic demands, food production, and releasing value from the ever-increasing flow of ocean-related data. Timed to coincide with Danish Maritime Days, the conference will attract key players within maritime and the ocean industry, as well as financial, advisory, and policy leaders. Nor-Shipping are in charge of the conference, which is held from the 2nd to 3rd of May. At present, two workshops have been planned: the Maritime Logistics and Cyber ​​Security at DTU on May 2nd, and the Driving Human Performance seen from an organizational perspective on May 3rd. Green-Jakobsen is in charge of the latter event. In addition to these workshops, the event Danish Ship of the Year will be held, although a date for the event has not yet been announced - plus numerous workshops and events that are still in the process of being planned.